Most passenger cars around the world are gasoline fueled although the fraction that is diesel fueled is starting to grow in some countries and in Western Europe is approximately 50%. Gasoline is a complex mixture of volatile hydrocarbons used as a fuel in internal combustion engines. The pollutants of greatest concern from gasoline-fuelled vehicles are CO, HC, NOx, lead and certain toxic hydrocarbons such as benzene. Each of these can be influenced by the composition of the gasoline used by the vehicle. The most important characteristics of gasoline with regard to its impact on emissions are – lead content, sulfur concentration, volatility, and benzene level. Tables 10.1.2-1 and 10.1.2-2 summarize the impacts of various diesel fuel qualities on emissions from light duty gasoline vehicles. Many countries and cities especially throughout Asia have much higher proportions of two and three wheeled vehicles than four wheeled vehicles. While emissions from these vehicles are expected to be influenced by fuel characteristics, there has been very little study focused on the impacts of specific fuel parameters on these vehicles. 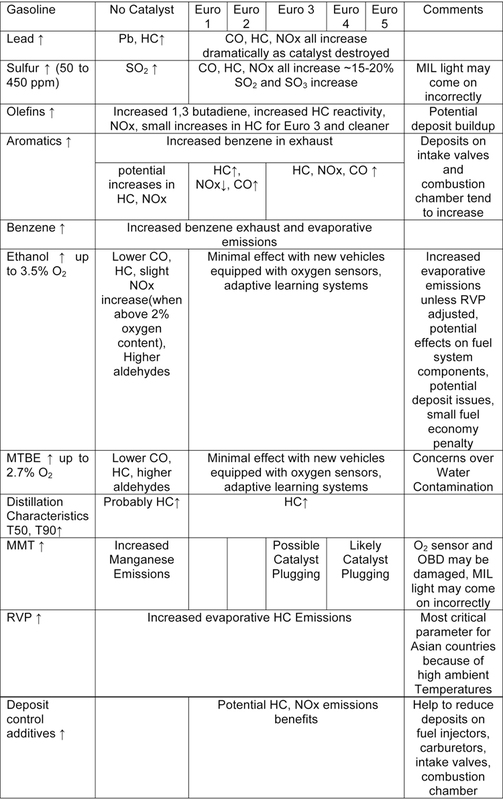 However, based on the limited available data and the combustion similarities between these and other internal combustion engines, these impacts are estimated to be as shown in the table below (10.1.2-2). Most two and three wheeled vehicles currently used are not equipped with catalytic converters to control emissions. Therefore it would seem that the impact of the various fuels parameters will be similar to those from pre Euro 1 cars. Some catalysts are starting to enter the fleet as emissions standards are being tightened, especially in India, Taipei,China and Europe. These vehicles are anticipated to be impacted by sulfur and lead in a manner similar to Euro 1 and 2 gasoline fueled cars. For two and three wheeled vehicles equipped with 2-stroke engines, the amount and quality of the lubricating oil is probably more important for emissions than fuel quality. The use of catalyst exhaust gas treatment required the elimination of lead from gasoline. This change, which has occurred throughout most of the world, has resulted in a dramatic reduction of ambient lead levels. Other gasoline properties that can be adjusted to reduce emissions include, roughly in order of effectiveness, sulfur level, vapor pressure, distillation characteristics, light olefin content, and aromatic content (Sawyer, 1993). Lead additives have been blended with gasoline, primarily to boost octane levels, since the 1920s. 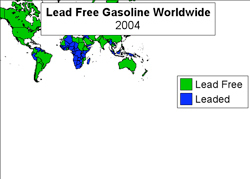 Lead is not a natural constituent of gasoline, and is added during the refining process as either tetramethyl lead or tetraethyl lead. In addition to increasing the octane level of gasoline, lead also lubricates the engine valves/valve seat interface of vehicles that have soft valve seats, thereby minimizing wear. Vehicles using leaded gasoline cannot use a catalytic converter and therefore have much higher levels of CO, HC and NOx emissions. In addition, lead itself is toxic. Lead has long been recognized as posing a serious health risk. It is absorbed after being inhaled or ingested, and can result in a wide range of biological effects depending on the level and duration of exposure. Children, especially under the age of 4, are more susceptible to the adverse effects of lead exposure than adults. 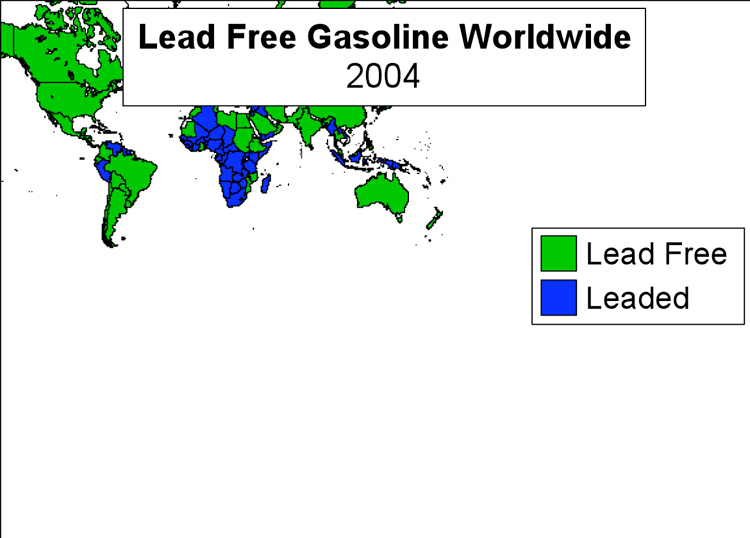 Figure 10.1.2-3 above shows that almost every country in the world has eliminated the use of leaded gasoline. Notable exceptions include northern Africa, Northern South America and Indonesia. Sulfur occurs naturally in crude oil. Its level in refined gasoline depends upon the source of the crude oil used and the extent to which the sulfur is removed during the refining process. Sulfur in gasoline reduces the efficiency of catalysts designed to limit vehicle emissions and adversely affects heated exhaust gas oxygen sensors. 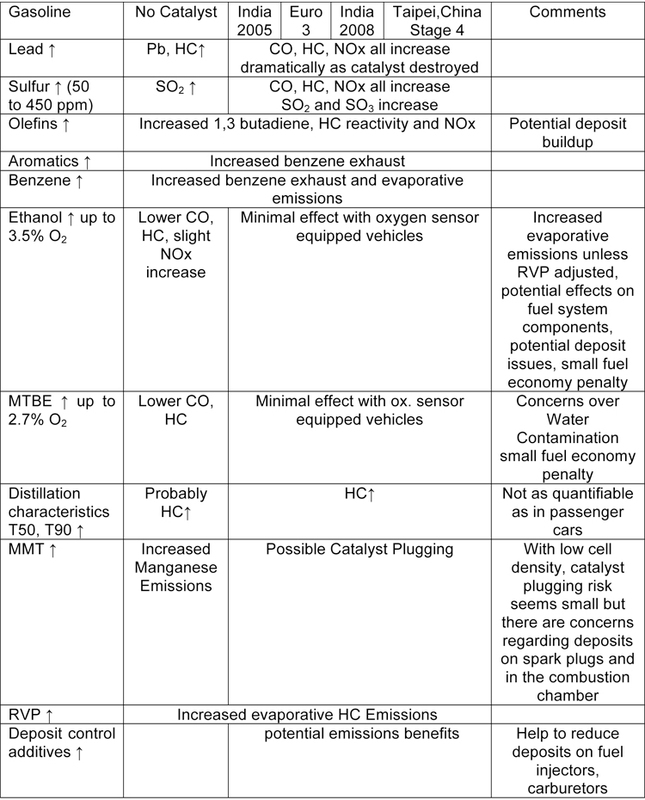 High sulfur gasoline is a barrier to the introduction of new lean burn technologies using DeNOx catalysts, while low sulfur gasoline will enable new and future conventional vehicle technologies to realize their full benefits. If sulfur levels are lowered, existing vehicles equipped with catalysts will generally have improved emissions. Laboratory testing of catalysts has demonstrated reductions in efficiency resulting from higher sulfur levels across a full range of air/fuel ratios. The effect is greater in percentage for low-emission vehicles than for traditional vehicles. Studies have also shown that sulfur adversely affects heated exhaust gas oxygen sensors; slows the lean-to-rich transition, thereby introducing an unintended rich bias into the emission calibration; and may affect the durability of advanced on-board diagnostic (OBD) systems. The EPEFE study demonstrated the relationship between reduced gasoline sulfur levels and reductions in vehicle emissions. It found that reducing sulfur reduced exhaust emissions of HC, CO and NOx (the effects were generally linear at around 8-10% reductions as fuel sulfur is reduced from 382 ppm to 18 ppm). The study found that the effects tended to be larger over higher speed driving than in low speed driving. The study results confirmed that fuel sulfur affects catalyst efficiency with the greatest effect being in the warmed up mode. In the case of air toxins, benzene and C3-12 alkanes were in line with overall hydrocarbon reductions, with larger reductions (around 18%) for methane and ethane. The combustion of sulfur produces sulfur dioxide (SO2), an acidic irritant that also leads to acid rain and the formation of sulfate particulate matter. In the European Union, the Euro 3 and 4 gasoline specifications set maximum sulfur content limits of 150 ppm and 50 ppm respectively (Euro 2 limits were 500 ppm). Subsequently, these limits were tightened to require 10 ppm sulfur fuel to be widely available in each member state in 2005 and for all gasoline to meet these limits by 2009. Several EU countries such as Sweden and Germany already provide fuels meeting these limits. Gasoline volatility is an indication of how readily a fuel evaporates. It is characterized by two measurements – vapor pressure and distillation. Reid vapor pressure (RVP) is a measure of the volatility of gasoline at 100°F (37.8°C) in kilopascals (kPa). The RVP is largely governed by the fuel’s butane content, whose average RVP is around 350 kPa. Pentanes, with an RVP of about 17 kPa, add volatility to a lesser extent. Butane content is partly a function of the nature of the crude, but occurs mostly as a result of the refining process. Sufficient volatility of gasoline is critical to the operation and performance of spark ignition engines. At lower temperatures, higher vapor pressure is needed to allow easier start and warm up performance. Control of vapor pressure at high temperatures reduces the possibility of hot fuel handling problems such as vapor lock and carbon canister overloading. Vapor lock occurs when too much vapor forms in the fuel system and fuel flow decreases to the engine. This can result in loss of power, rough engine operation or engine stalls. High gasoline vapor pressure causes high evaporative emissions from motor vehicles and is therefore a priority fuel quality issue. Evaporative emissions can comprise a large part of total hydrocarbon emissions. Their release may occur during the delivery and transfer of gasoline to storage, vehicle refueling, the diurnal breathing of vehicle fuel tanks (as they heat up and cool down with normal daily temperature variations), and the fugitive losses that occur from carburetor and other equipment during normal vehicle operation. Reductions in fuel volatility will significantly reduce evaporative emissions from vehicles. A reduction in vapor pressure is one of the more cost effective of the fuel-related approaches available to reduce hydrocarbon emissions. Vapor pressure is most effectively managed on a regional and seasonal basis to allow for the different volatility needs of gasoline at different temperatures. The reduction of evaporative emissions is most effectively achieved when RVP is controlled when ambient temperatures are high – i.e. the summer period. In the European Union, the Euro 3 gasoline specifications identify eight volatility classes. Each class is based on seasonal temperature variations and specifies a range of RVP values. Class 1 is the most stringent situation, with the lowest RVP values, for the warmest climates, with classes 7 and 8 applicable in very cold conditions where more volatile gasoline blends are required. The specifications also set a maximum summer (May to September) limit of 60 kPa. For member states with arctic conditions, summer is from 1 June to 31 August and the RVP is set higher at 70 kPa. In the USA and more especially in California where hot ambient conditions are prevalent, the levels of RVP set by the USEPA and California Air Resources Board are close to 50 kPa. In Asian countries where summer conditions are experienced throughout the year, the RVP limits at low levels are very critical. In one study for Thailand, reducing the RVP by 6.89 kPa was estimated to result in reductions in HC emissions of more than 100 tons per day. Distillation is a second method for measuring the volatility of gasoline. Distillation can be assessed in terms of ‘T’ points or ‘E’ points. For instance, T50 is the temperature at which 50% of the gasoline distils, while E100 is the percentage of gasoline distilled (‘E’ – evaporated) at 100°C. Excessively high T50 point (low volatility) can lead to poor starting performance at moderate ambient temperatures. The measure of the Driveability Index (DI), which is derived from T10, T50, and T90 and oxygenate content, can be used as a control to facilitate cold start and warm-up performance. Use of a DI also helps to avoid inclusion of a high proportion of high density poor burning compounds which contribute to carbon monoxide and NOx emissions. The EPEFE study found that increasing E100 in gasoline reduces emissions of hydrocarbons but increases NOx emissions. At E100, carbon monoxide emissions were at their lowest value of 50% by volume, for constant aromatics. Increasing E100 from 35% to 50% by volume showed a decrease in mass emissions of both formaldehyde and acetaldehyde. But increasing E100 from 50 % to 65 % by volume showed no clear effect. Limiting distillation temperatures and aromatic content appear to be the most important parameters for controlling emissions during the vehicle’s ‘cold cycle’. Heavy end limits (and total aromatic limits) provide the best means to limit heavy aromatics, important in managing hydrocarbon and benzene emissions. Research shows that combustion chamber deposits formation can relate to the heavy hydrocarbon molecules found, inter alia, in the T90-FBP portion of the gasoline. A major benefit of reduced combustion chamber deposits is a reduction in NOx emissions. In the European Union, the Euro 3 gasoline specification addresses distillation in terms of two E points: E100 – 46 % vol min, and E150 – 75 % vol min, and final boiling point (FBP) – 210°C max. Attention has been given in recent years to the specific make-up of the hydrocarbon content of gasoline. This is due both to the significant role hydrocarbon based vehicle emissions play in urban ozone (or photochemical smog) formation, and to the fact that there are significant adverse public health impacts from exposure to certain hydrocarbons. As a result, there has been a move towards setting content limits on the different hydrocarbon fractions within gasoline especially the aromatics and the olefins. An olefin is a family of chemicals containing carbon-to carbon double bonds. Olefins are unsaturated hydrocarbons (such as propylene and butylenes) and, in many cases, are also good octane components of gasoline. They can, however, lead to engine deposit formations and increased emissions of highly reactive ozone-forming hydrocarbons and toxic compounds. They tend to be chemically more reactive than other hydrocarbon types. Olefins are oxidatively and thermally unstable and may lead to gum formation and deposits on the fuel injectors and in the engine’s intake system. Combustion chamber deposits form from the heavy hydrocarbon molecules found, inter alia, in the olefin portion of gasoline. Combustion chamber deposits can increase tailpipe emissions, including carbon monoxide, hydrocarbons and NOx. Emission of olefins into the atmosphere as chemically reactive species contributes to ozone formation and toxic dienes. The US Auto/Oil program concluded that reducing total olefins from 20% to 5% would significantly decrease ozone-forming potential. Reduction of low molecular weight olefins accounts for about 70% of the ozone reduction effect. Not only does the ozone formation potential of olefins predominantly derive from the lighter volatile olefin fractions, but also these fractions are typically removed where reductions in low levels of RVP at 48-50 kPa are required. In addition, 1,3-butadiene, a known carcinogen, is formed during the combustion of olefin compounds in gasoline. The European Union fuel specifications for Euro 3 set a maximum olefin content of 18% by volume. Under both Phases of the US reformulated gasoline (RFG) program, the olefin specification is a maximum 8.5% by volume. The Californian RFG program (effective from 1996) provides several compliance options for meeting the refiner limits for olefins, one option being the utilization of a maximum (flat) limit of 6% by volume or an averaging limit of 4% by volume coupled with a cap of 10% by volume. Aromatics are hydrocarbon fuel molecules based on the ringed six-carbon benzene series or related organic groups. They contain at least one benzene ring. Benzene (discussed separately below), toluene, ethylbenzene and xylene are the principal aromatics. They represent one of the heaviest fractions in gasoline. Lower levels of aromatics enable a reduction in earlier catalyst light-off time for all vehicles. Research indicates that combustion chamber deposits can form from the heavier hydrocarbon molecules found in the aromatic hydrocarbon portion of the gasoline. These deposits can increase tailpipe emissions, including carbon dioxide, hydrocarbons and NOx. The aromatic content of gasoline has a direct effect on tailpipe carbon dioxide (CO2) emissions. The EPEFE study demonstrated a linear relationship between CO2 emissions and aromatic content. A reduction of aromatics from 50 to 20% was found to decrease CO2 emissions by 5%. This was considered to be due to their effect on the hydrocarbon ratio and hence carbon content of the gasoline - no clear effect of aromatics was found on calculated fuel consumption. Combustion of aromatics can lead to the formation of toxic benzene in exhaust gas. Benzene is a proven human carcinogen that can cause leukemia in exposed persons. It is estimated that about 50% of the benzene produced in the exhaust is the result of decomposition of aromatic hydrocarbons in the fuel. Both the AQIRP and the EPEFE studies showed that lowering aromatic levels in gasoline significantly reduces toxic benzene emissions from vehicle exhausts. In the EPEFE study, benzene emissions were found to vary between 3.6% and 7.65 % of total volatile organic compounds for fuel aromatic contents ranging from 19.5% to 51.1% by volume. This is consistent with previous studies and can be explained by the dealkylation of substituted aromatics. The EPEFE study also found that emissions changes from changes to the aromatic content of fuel were influenced by other parameters such as distillation. Reducing the aromatic content of gasoline also contributes to the reduction of NOx. The European Union fuel specifications for Euro 3 and Euro 4 set maximum aromatic content limits of 42% and 35% by volume respectively. Phase 1 (January 1995): 27%; and Phase 2 (January 2000): 25%. Phase 1 (January 1992) 32%; and Phase 2 (January 1996) 22%. In Japan, the specifications for regular and premium grades set maximum aromatic content levels at 42% by volume. In South Korea they were set as maximum limits by volume at 45% in 1998, reducing to 35% in January 2000. Benzene is a six-carbon, colorless, clear liquid aromatic that occurs naturally in gasoline and is also a product of catalytic reforming used to boost octane levels. It is fairly stable chemically but highly volatile. It has a high octane rating - RON 106, MON 103. Benzene in gasoline leads to both evaporative and exhaust emissions of benzene. The EPEFE study found that benzene exhaust emissions varied between 3.6% and 7.65% of total volatile organic compounds from gasoline containing benzene of 1.7% to 2.8% by volume. As noted in the preceding section, the key health concern related to benzene exposure is leukemia. The control of benzene levels in gasoline is recognized by regulators as the most direct way to limit benzene evaporative and exhaust emissions and therefore human exposure to benzene. As a result, over the last decade there has been a steady move by regulators to lower the benzene content of gasoline. In the European Union, the Euro 3 and 4 gasoline specifications set maximum benzene limits of 1% by volume (the Euro 2 limit was 5%). The US set a flat limit of 0.8% benzene by volume from January 1995 and has continued with this limit under Phase 2 of the reformulated gasoline (RFG) program, effective from January 2000. It has recently proposed a national cap on benzene limits similar to those on reformulated gasoline. Japan introduced a maximum limit of 5% benzene by volume in 1996, which was reduced to 1% in 2000. In Singapore the current limit is 4%, and in Thailand it is 3.5% for all gasoline grades with a future target of 1%. Oxygen is added to gasoline to improve combustion, to limit emissions of ozone precursors and carbon monoxide, and/or to raise octane levels. The principal oxygenates which are used today are ethanol and MTBE. Where ethanol is used, evaporative HC emissions can increase significantly if the RVP of the fuel is allowed to increase. Increases in NOx exhaust emissions can occur with either oxygenate when the oxygen content is higher than 2 weight %. (There is some debate regarding the NOx effect for newer technology vehicles.) The magnitude of the reductions in HC exhaust emissions depends upon the vehicle technology; while older (pre Euro 1) vehicles would experience some reductions in exhaust emissions, newer vehicles (Euro 1 and newer) with oxygen sensors and adaptive learning systems will experience little or no effects. HC emissions during storage and transportation depend upon the presence or absence of Stage I and Stage II vapor recovery systems. Carbon monoxide emissions can decrease by around 10% following an increase in gasoline oxygen content from 0 to 2% (by weight). Certain other additives which are put into gasoline can also affect vehicle emissions. Methylcyclopentadienyl manganese tricarbonyl (MMT) when added to gasoline will increase manganese emissions from all categories of vehicles. Vehicle manufacturers have expressed concerns regarding catalyst plugging and oxygen sensor damage with MMT use which could lead to higher in use vehicle emissions especially at higher mileage. The impact seems greatest with vehicles meeting tight emissions standards and using high cell density catalyst substrates. Deposit control additives can reduce the build up of deposits on various engine components including fuel injectors and carburetors thereby maintaining low emissions from vehicles.